Welcome back to yet another review, this issue was more of what we got last week. As always we begin with the cover, where we see Batman standing over the city. It is drawn well and reminds of the artwork from The Long Halloween. We start the story where we left off, as Mr. Bygone tells James Corrigan that he is making the monsters unknowingly. This is a very interesting twist and Mr. Bygone and James Corrigan are both well drawn. I feel this James Corrigan sub story is a set up for a Spectre solo comic. As the monsters surround James Corrigan, we cut to the Joker’s daughter tying up Batwing while she is giving Batman false information though his com. The Joker’s daughter is drawn nicely. We see Batman also in this scene but don’t need to. We cut to Batman watching over an active crime scene where James Bard is getting a bit too violent with the criminal. Vicki Vale comes to report but for some reason James Bard is a jerk to her. Vicki Vale and James Bard are drawn plain. If James Bard turns out to be a bad guy, I’m not going to be surprised. Back at Arkham, Professor Pyg is guided by fake guards and doctors to a room as he shocked to see what’s in it. We get a good use of a close up with Professor Pyg drawn the best he has been. In Japan, Harper Row and Red Robin continue the investigation as they get attacked by a robotic tentacle. Red Robin is drawn plain and Harper Row is drawn decently. Red Robin yells at Harper Row for interfering as a man in a safari hat with no limbs introduces himself. The man with no limbs is being carried by a monkey and is drawn really well. This is more ridiculous than scary, of course I would love to be carried by a monkey. Back at Arkham the monsters are doing the Temple of Doom move on James Corrigan. He quickly grabs the monster’s hand and beats them up along with Mr. Bygone. This would be creepy except that we have seen this before and James Corrigan is part ghost. Meanwhile underground Batwing tricks the Joker’s daughter to come close to him so that he can pop a rope out of suit and tie her up. I like how Batwing tricks the Joker’s daughter but The Joker’s daughter is a bit too gullible. Personally I would make scenes of Batwing and the Joker’s daughter a little bit darker. The Joker’s daughter calls a buff guy called Maxie to come and help her. Maxie is drawn very detailed although there are some parts of his body that I’m not sure if it’s sweat or light. I don’t really care if this new character is a one-time deal. Batwing and Maxie brawl with the favour in Maxie’s court. The Joker’s daughter just yaks away about the Joker in general as the fight goes on, but I do not expect to see the Joker anytime soon. The fight between Batwing and Maxie is a bit boring. Batwing gets the upper hand on Maxie and strangles him to unconsciousness. Yet again the take-down is a bit boring but it is drawn well. There is a computer talking. I can only assume it is Batwing’s suit. 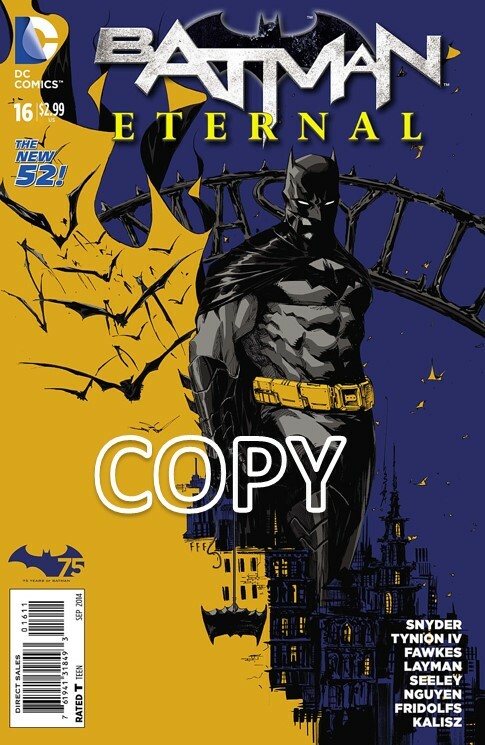 We get a close-up of Batwing and a detailed drawing of his upper suit. After the fight Batwing starts to wander is search of James Corrigan. The background artwork looks great in some panels but other panels are a bit lacking. Where is the Joker’s daughter? She was right there during the fight. Batwing runs into a dying man as the man’s spirit separates from his body. The separation is drawn amazingly well. James Corrigan comes into the room to explain that there is nothing they can do for the dying man. James Corrigan is drawn a bit better than he was earlier in the book. We end with the pair interrupted as Blackfire enters the room with a small army. Blackfire is too small on the page for me to determine if he is drawn well or not. This issue was a good story with a few problems that I can easily forgive.